The story of the first U.S. women pilots to be tested for spaceflight is the focus of the new Netflix documentary "Mercury 13." A famous scene from space history gets an unexpected twist in the first moments of "Mercury 13," a new documentary now streaming on Netflix. "That's one small leap for a woman, another giant step for mankind." "It did not enter into my consciousness there was anything unusual about the fact it was twelve men who had walked on the moon," said Sington of his perspective while he was directing the 2007 documentary film "In the Shadow of the Moon" about the Apollo missions. "Of course, when I came across this story and was invited to do a bit of directing on the topic by my colleagues at Netflix, I quickly realized that I had made this assumption that it was just natural." "But it wasn't natural. It was a choice that had been made," he said. "Mercury 13," released by Netflix on Friday (April 20), tells the history of the U.S. women pilots who were privately put through the same medical, physiological and psychological testing as NASA's original, all-male Mercury 7 astronauts. Had history played out differently, one or more members of the Fellow Lady Astronaut Trainees, or FLATs, could have joined the likes of John Glenn and Neil Armstrong onboard the United States' early flights into Earth orbit and onto the moon. "I had never heard anyone give even an inkling of this, and that was something that interested me — a new take on a story you hear all of the time," said Walsh, who previously worked with Sington on the documentary TV series "Moon Machines." "The story is not exactly new," Sington told collectSPACE.com. "There have been books about it and even some television made about it, but it somehow hasn't penetrated. The vast majority of people know nothing about this." "I think that's quite telling," he said. "The story itself is seen as a bizarre little wrinkle, but in-of-itself it is bizarre that it is bizarre when you really think about it." Key art for the new Netflix documentary "Mercury 13." Sington and Walsh filmed four of the surviving members of the Mercury 13 — Gene Nora Jessen, Sarah Ratley, Wally Funk and Rhea Woltman — as well as the family members of two others. Their stories shaped the narrative presented in "Mercury 13." "Having been green lit in October, we went out to interview all of the available Mercury 13 women who we could talk to without having any real agenda about what the film should be about," Sington said. "We determined we'd emphasize the things that the interviewees, our subjects, thought were important. Let them tell their story." Their personal accounts turned out to be one of hope and disappointment. 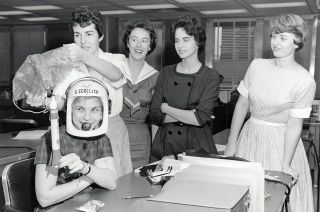 Although the women performed as well, if not better, on the extensive tests that qualified the Mercury astronauts for spaceflight, the "Women in Space" program led by the Lovelace Clinic never had NASA's endorsement and ultimately met its end with President Lyndon Johnson ordering to "stop this now." The first American woman to fly into space, Sally Ride, did not do so until 1983 — two decades after the Mercury 13 were rejected and Soviet cosmonaut Valentina Tereshkova became the first woman in space. The first U.S. woman to pilot a spacecraft, Eileen Collins, flew in 1995 (Sington and Walsh also interviewed Collins for "Mercury 13"). "There is no doubt that the women could have done it, so there was no reason that women shouldn't have walked on the moon," said Sington. "If you think about that moment when the whole world was looking and everybody was thinking about those men on the moon, how amazing it would've been if there had been a woman? That would have changed the temperature, the global thinking about men in a really profound way." "That was a fantastic missed opportunity," he said. Watch the official trailer for the Netflix documentary "Mercury 13" at collectSPACE. Follow collectSPACE.com on Facebook and on Twitter at @collectSPACE. Copyright 2018 collectSPACE.com. All rights reserved.